The Autonomous Space Agency Network (ASAN), a global network which promotes open source and ‘DIY’ space exploration, said it executed the first protest in near space on Wednesday to mark Yuri’s Night - a commemoration of the first human spaceflight by Russian cosmonaut Yuri Gagarin. 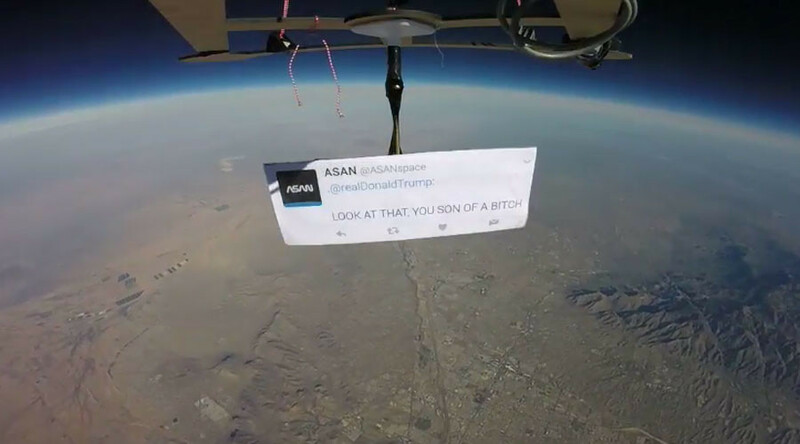 Drawing on inspiration from Apollo 14 astronaut Edgar Mitchell - the sixth person to walk on the moon - the agency tweeted a no nonsense message to President Trump alongside spectacular footage of the same message dangling from space. ASAN said the giant tweet print-out was launched from one of dozens of concrete crosses near Phoenix, previously used to calibrate the first spy satellites. It was attached to a weather balloon to an altitude of 90,000 feet, within near-space. The group said the ‘protest’ was in solidarity with the upcoming March for Science which is planned for Earth Day (April 22) and is aimed at defending the “vital role” of science in society.